Domestic Violence is a pattern of behavior used to gain and maintain power and control over an intimate partner. Abuse can be physical, sexual, emotional, economic and psychological. Domestic violence can happen to anyone regardless of race, ethnicity, gender, age, sexual orientation, religion, socioeconomic background education, or education level. Domestic violence is often used interchangeably when referring to Family Violence, Intimate Partner Violence (IPV), or Battering. In Texas, the legal definition of Family Violence (as defined by Texas Family Code 71.004) is "an act by a member of a family or household against another member of the family or household that is intended to result in physical harm, bodily injury, assault, or sexual assault or that is a threat that reasonably places the member in fear of imminent physical harm, bodily injury, assault, or sexual assault, but does not include defensive measures to protect oneself." Domestic violence may include a wide range of abusive tactics. 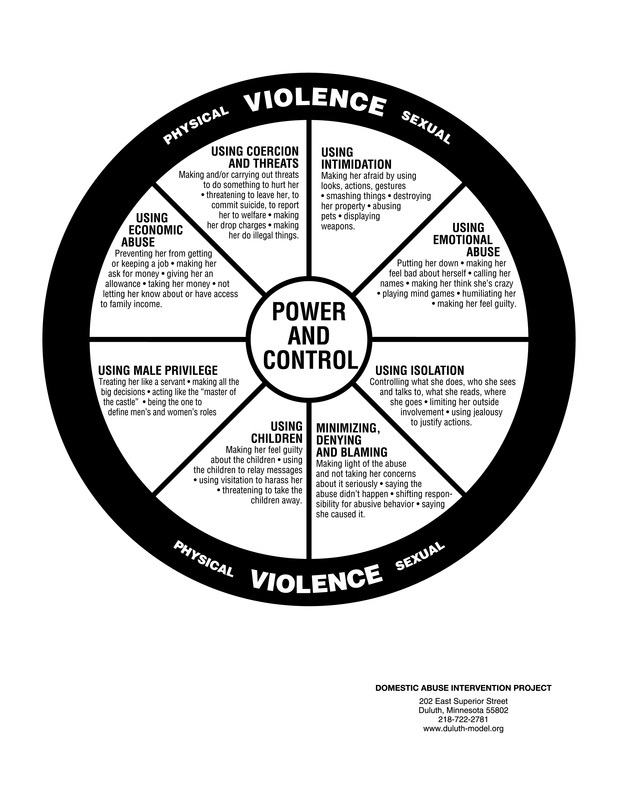 The Power and Control Wheel, created by the Domestic Abuse Intervention Project (DAIP), is a helpful tool in understanding the different tactics that can be used by a batterer to establish and maintain control over their partner.